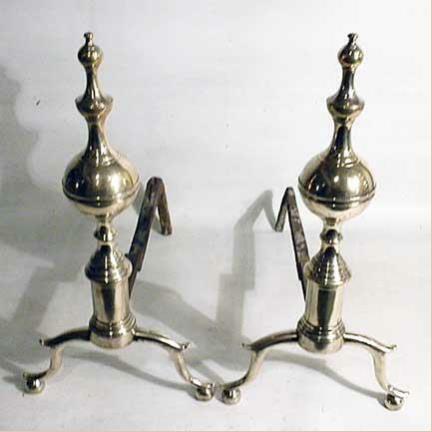 Andirons are constructed of metal to hold flaming firewood slightly above the firebox floor to improve fireplace draw and ventilation. 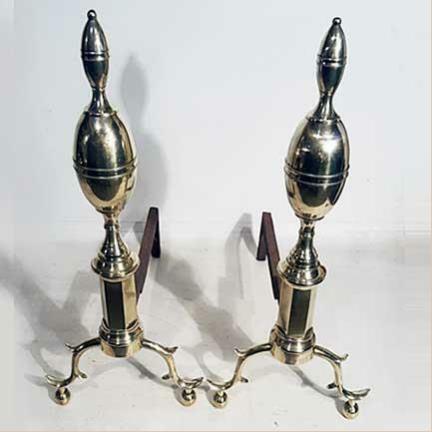 They typically stand upon two front legs connected to a central iron shaft, called a "dog" or "billet bar" which has a bent end to form the back foot. 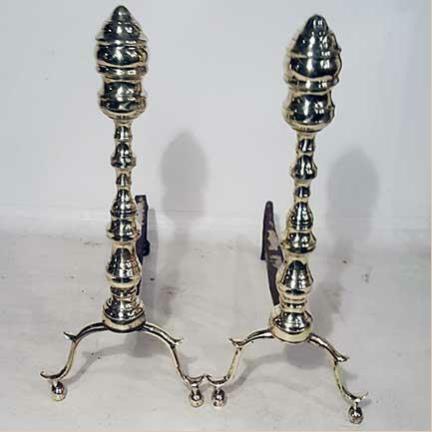 The andiron dogs or billet bars keep the flaming logs in the firebox of the fireplace as they burn and settle. 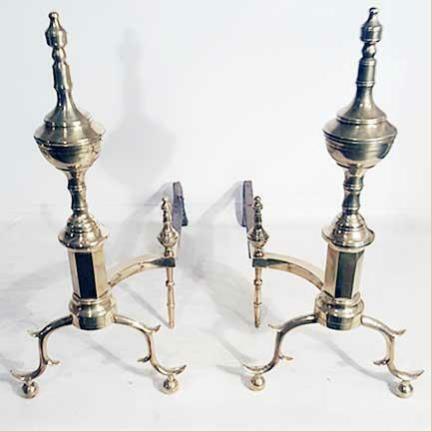 For centuries fireplaces have been furnished with all manner of andirons, with antique andirons adding to the visual interest of today's fireplaces. 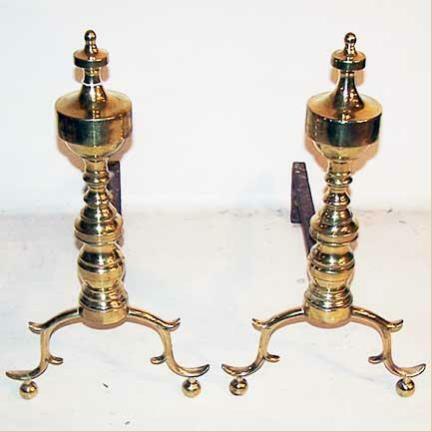 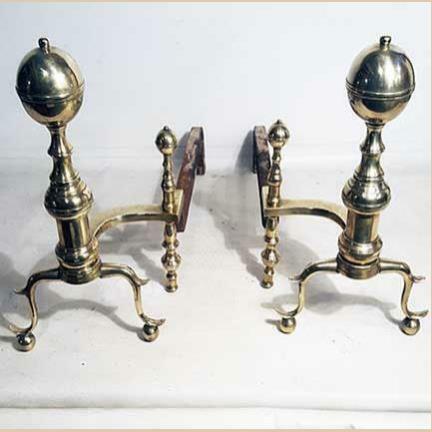 Andirons used in colonial America were crudely fashioned of iron by local blacksmiths. 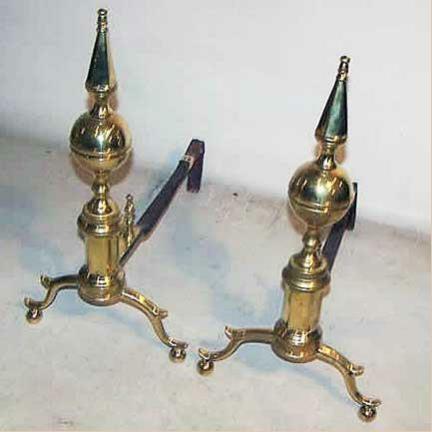 18th and 19th century andirons were constructed of three or more sections. 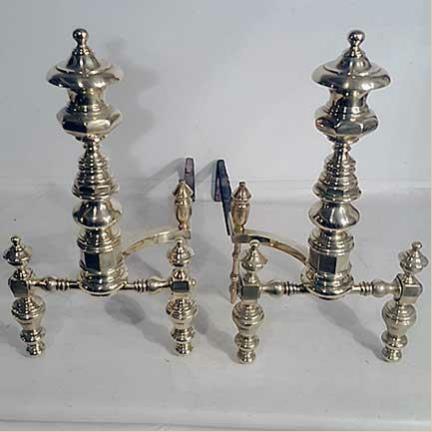 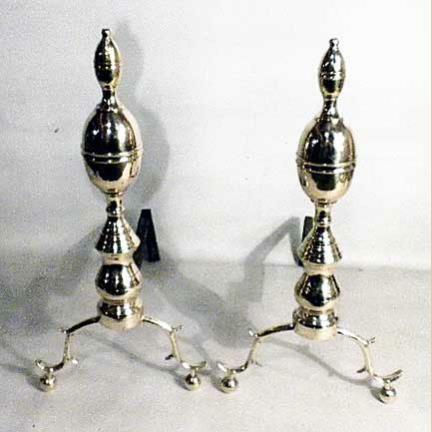 These sections (except the base or feet) were hollow, cast in halves and silver soldered together. 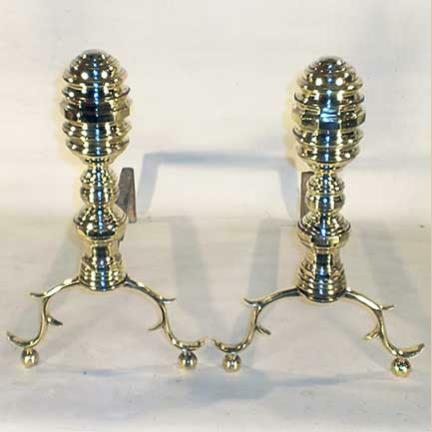 The soldered sections were then spun in a slow turn lathe to smooth and polish the sections. 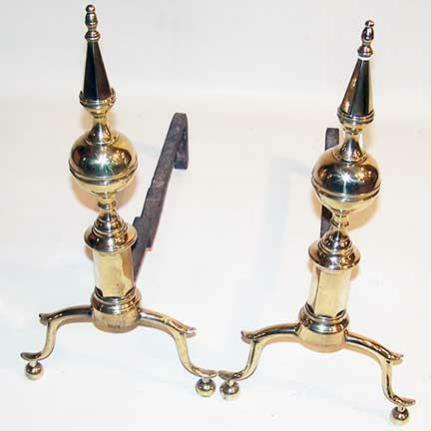 The joints (seams) could be easily seen by looking inside the various sections. 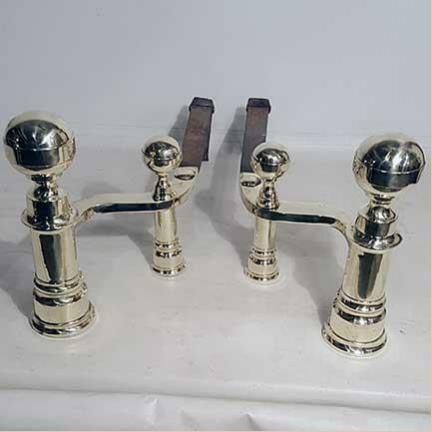 The top section had a threaded hole to accept a hand wrought threaded rod. 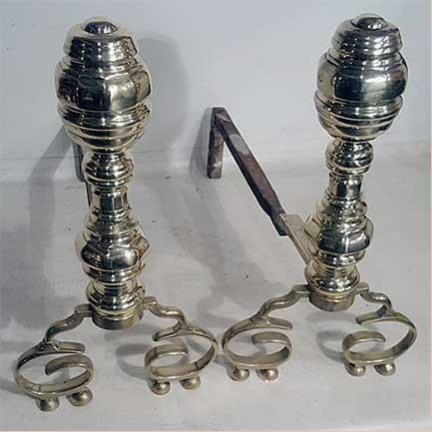 The rod was inserted through a centered hole in the feet and iron dog or billet bar (logs are placed on this to be burned). 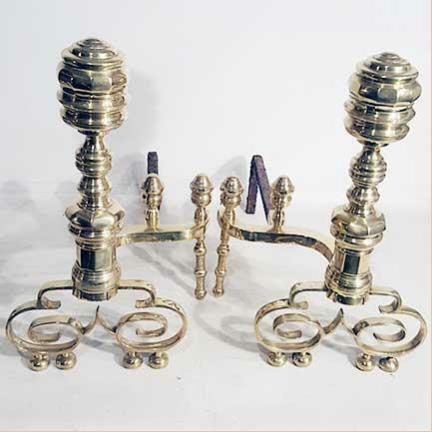 When this rod was peened over, it stabilized and tied all these parts together. 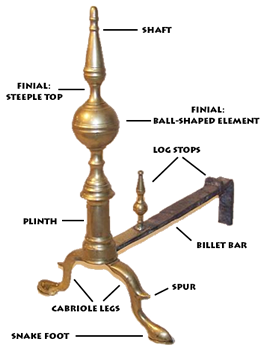 Inserting the plinth section, between the top and peened base, forms the finished andiron and made it ready to support the logs for a fire. 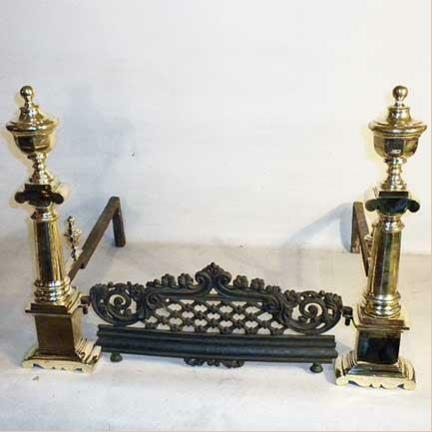 A well appointed fireplace, dressed with andirons, fenders, and other items, is a unique focal point and enhances the beauty of your surroundings. 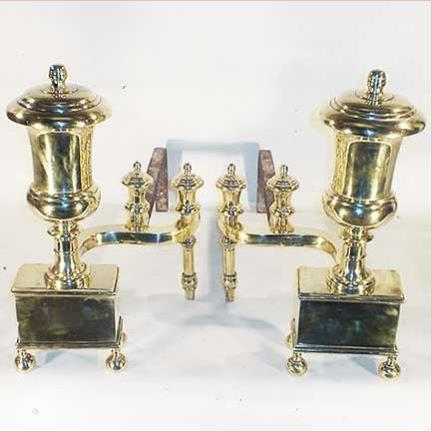 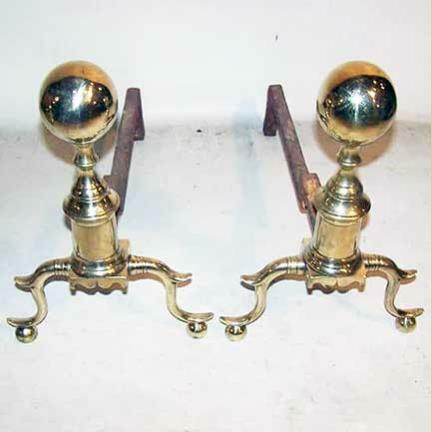 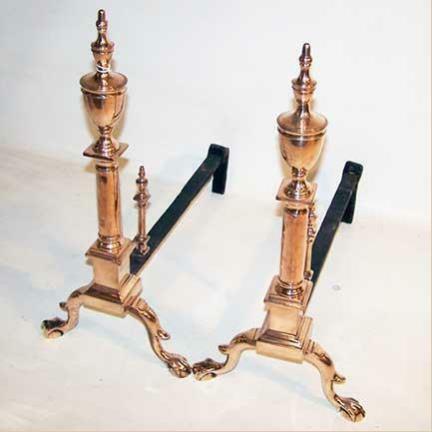 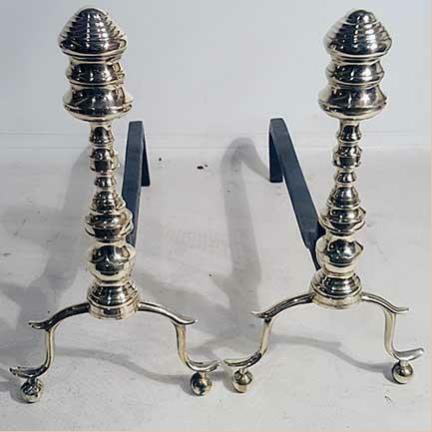 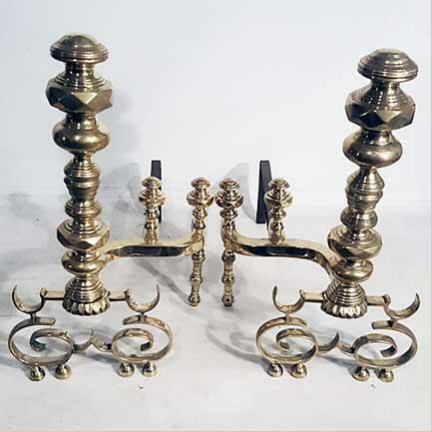 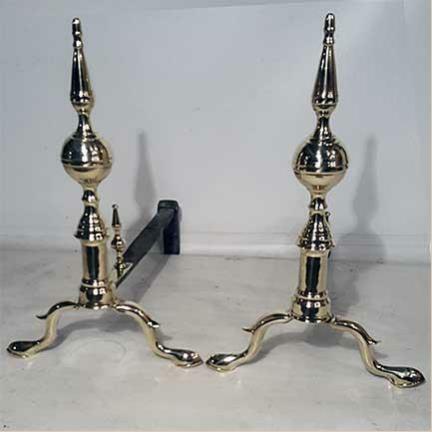 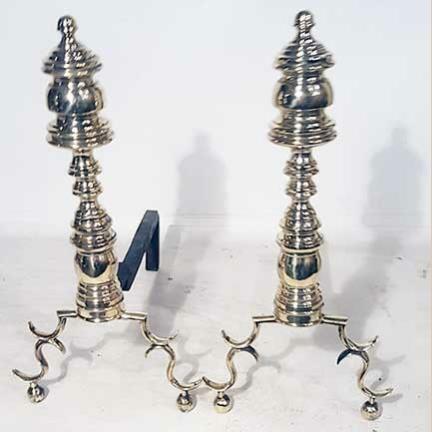 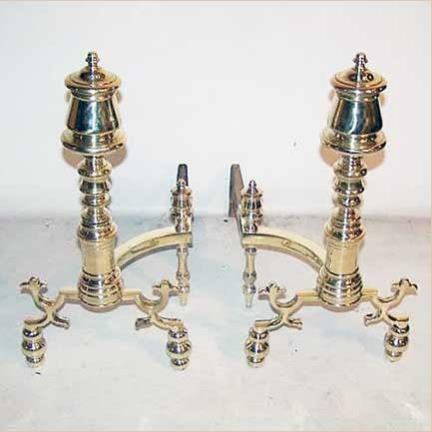 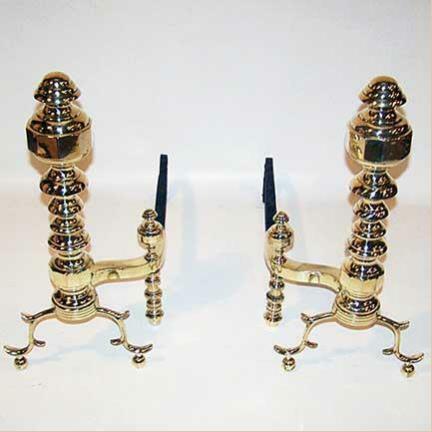 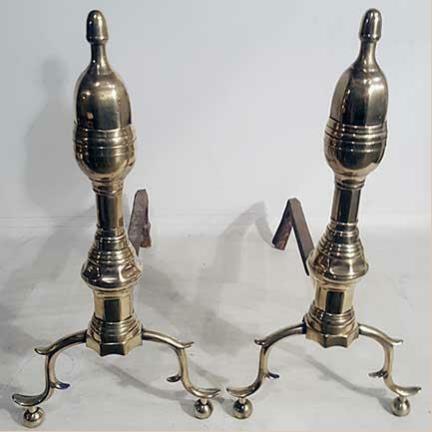 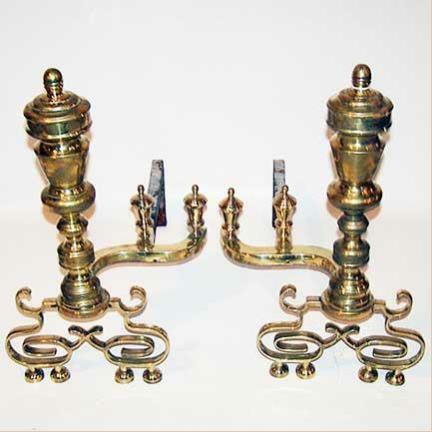 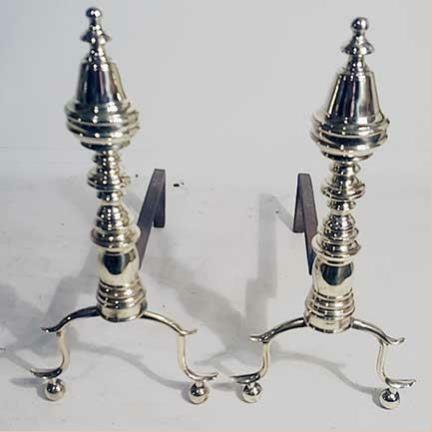 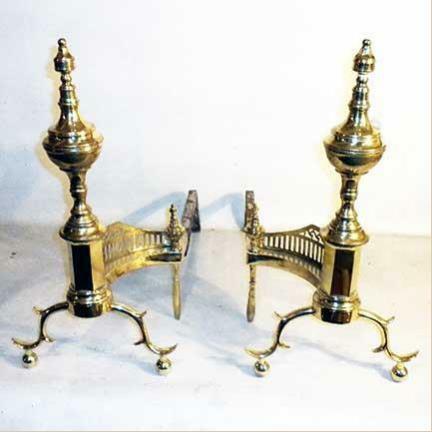 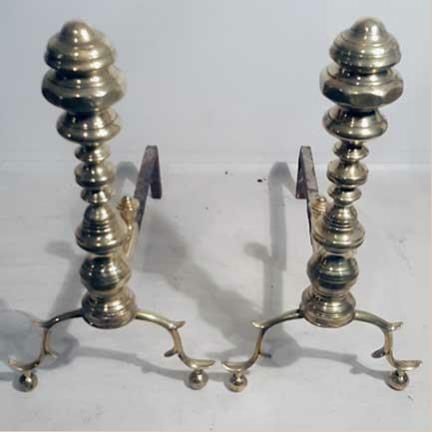 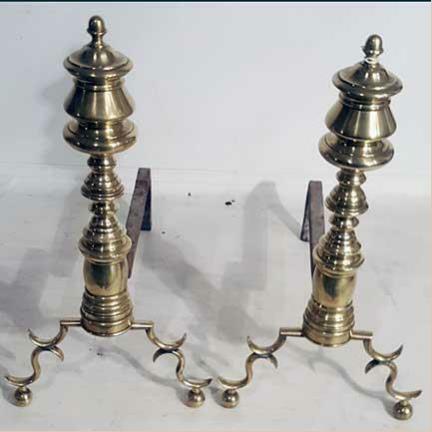 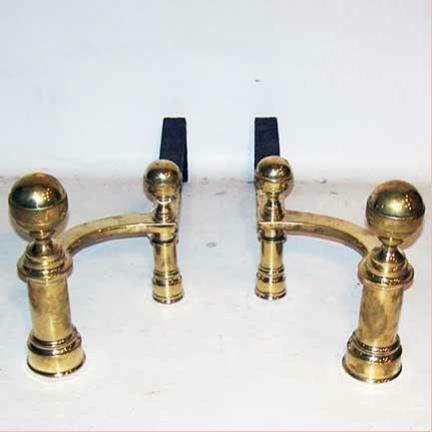 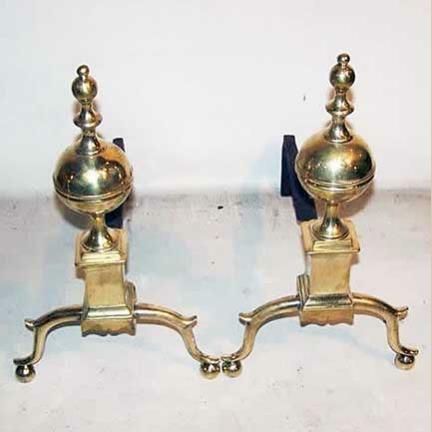 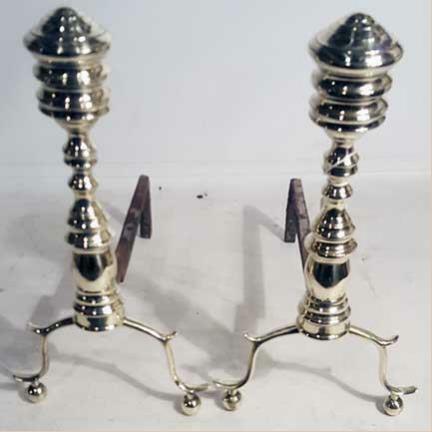 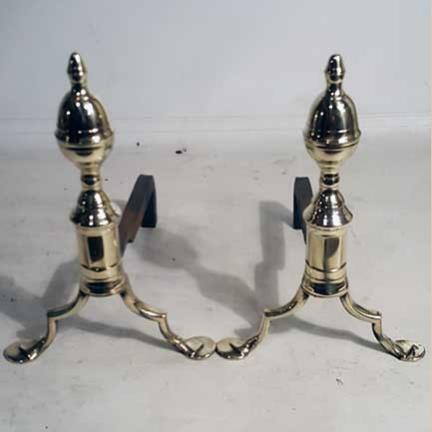 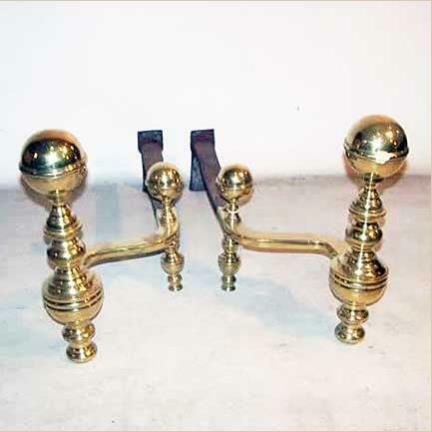 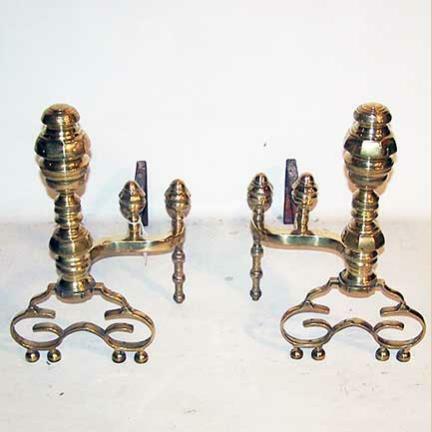 On this page are just a few of the antique andirons from our always evolving inventory. 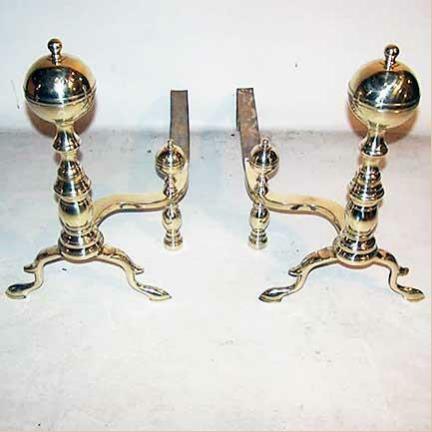 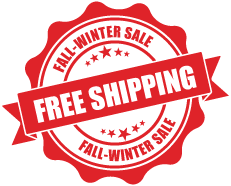 Feel free to contact us for more information regarding a specific item, either one of the ones shown here, or a piece you're having difficulty finding. 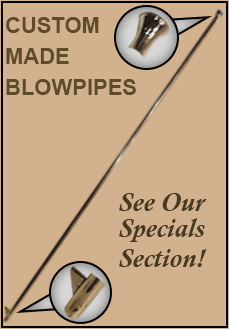 Chances are we have it, or can locate it for you.